In this video, Joan Hinde Stewart recalls the first book she ever checked out of a library — a biography of Joan of Arc — a memory triggered by an experience in her sixties. She describes the fascination she felt about Joan of Arc from an early age and the conflict she felt about reading this biography, as it was unsanctioned by the Catholic church. Formative experiences with the humanities have the power to shape our lives, returning to us again and again, to intrigue and inspire. 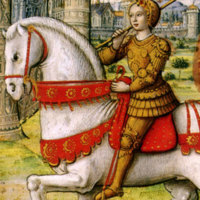 And, from the distance provided by age, experience, and deeper knowledge we sometimes come to appreciate those subjects — for instance the life of a remarkable woman like Joan of Arc — in new and more meaningful ways that continue to challenge and fascinate.